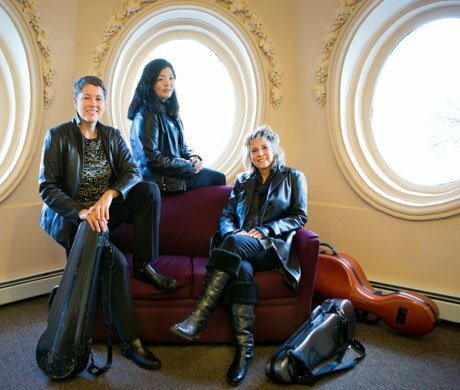 Its earlier date a casualty of one of Boston’s storms, Strings Theory Trio was fortunately included on the subsequent “Composers and Friends” event organized by Jerry Gates at Berklee’s David Friend Auditorium on Monday. I was struck by the many things that were different at a Berklee concert compared to one at a traditional classical venue. First of all, there was the recorded background music that played before and after the event, setting a club-like ambiance. And the program order was changed without any comment—Strings Theory Trio was listed third, and they went first. I’m fine with that; go with the flow. And then there’s an apparent rule that C & F concerts only last an hour. I’m sure there must be exceptions, but this one came in within 60 minutes (and I’ve been to ones that were cut short). And then there’s the dry, dry, dry acoustic of David Friend Auditorium. It’s great for instruments that are amplified, but for acoustic instruments the way every sound is exposed with no rounding of the corners or blurring of the colors places them under a microscope. So it’s not ideal in terms of sound—a richer resonance would have given everything a little more emotional depth. Nevertheless, it was exciting and enjoyable. Genre-defying is a cliché, but I think it’s apt for the ensemble of Mimi Rabson (the leader and main composer of the ensemble) and Helen Sherrah-Davies (they both play 5-string violin, which I guess no one calls the violalin), and cellist Junko Fujiwara. They began with Swoop, in which ascending major scale fragments coalesce into a vigorous upward ascent. There is a more hesitant interlude where the wholesome scale idea is broken into questioning fragments, but then it returns again with its bold strong steps. The next interlude featured percussive rhythm in cello and violin, while Sherrah-Davies wound a sinuous spiraling melody between them. The instruments recombine with some darker harmonic colors and interaction. The ascending scale eventually returns triumphantly. There is definitely a framework of improvisation which gives the performance a different kind of excitement from most classical pieces. On her website, Mimi Rabson prints the score for one piece, Flashback. This wasn’t on the program, but it explains the process, and the way the score combines improvised elements—and sometimes asks the musicians to be able to repeat their improvised themes. There is a video for Flashback here. Back to the concert, in the next piece, Impatient Traveler, a restless three-note rhythmic ostinato is interrupted by harsh repeated note gestures. The rhythm devolves to a simpler pattern, (with the continuous drive of a moto perpetuo) while a violin sustains long lines that gradually fragment back to the ostinato. A new heavy, stomping accompaniment idea is repeated in the lower strings while the ostinato is explored and recombined above. Eventually the cello gets to jam as well, offering spontaneous and wailing reactions to the structured elements that are themselves constantly transforming. Here again I’m not sure how much is improvised (spontaneous) versus preplanned and/ or written out. The effect is lively and engaging, a journey that you are thrilled to be on. Here’s one way in which I see this as genre-defying—the presence of improvisation and rhythmic drive suggest jazz, but the ostinato patterns evoke a post-modern minimalism. The accompaniment patterns sometimes shift so subtly that it might either be with clockwork precision or with a careful randomness—that we’re not sure is definitely part of the energy that keeps listeners engaged. The third piece, What’s My Line was by Junko Fujiwara, who explained it had started out as an exercise for a student who had problems remembering the notes on the lines of the music staff. It opens with a jagged bop tune played in unison; you could imagine it played by Dizzy Gillespie. Then that was explored with repeated-note motives and exchanges that somehow brought to mind that string quartet attributed to Benjamin Franklin, played entirely on open strings. [Listen here]. It was certainly, fun, lively and full of energy! Rabson described her Adagio as a ballad, but I heard it as much more anguished and profoundly existential, rather than a lyrical expression. While the other two strings create a barren, empty landscape, like Shostakovich’s Siberia, Rabson’s violin wanders nervously, even frantically, evoking a desperate angst, perhaps the soliloquy of a schizophrenic. The background was layered chords, like slowly shifting tectonic plates, or breaking ice floes. Rabson’s gestures cut into them, creating cracks and fissures. This Adagio is the second movement of a four movement work, which is available on the CD. Hearing this one movement makes one very eager to hear the rest of the work, to experience the rest of the intense voyage. Nirvary, the last piece of the set, was inspired by Nirvana (for the uninitiated, a rock band that was active ca. 1990). Here we were urged to clap on the back beat to the scratchy rhythm, as the strings evoked distorted electric guitars and pounding drum set. This last piece is not on the new CD, but it was a fun conclusion to their set. And what about this CD? It contains 14 tracks, with two pieces by Fujiwara, one by Sherrah-Davies, and the rest by Rabson, who says just email her, and she will send you one for free, her website is here. I don’t know if it has much hope of going viral that way, but I hope it does generate interest. All of this was exciting, and sometimes fun, sometimes powerful. Next, composer Jerry Gates let an ensemble of nine instruments in Elves of Masur, which he composed while working in Poland. It began with random squeaks and fragments starting softly and then building atmospherically (as elves emerging from their forest hiding places?) A crisp motive emerges and is exchanged by all the instruments. The rhythm evolves to a Mazurka (in 3/4 time), with an evocative and sweetly melancholy tune in the bassoon. Hand percussion varied the accompaniment, and Rabson had a spicy violin solo on the violin. The effect was refreshing and lilting, and with a surprise syncopated ending. Did Gates realize his baton was in his back pocket? I bet he had been looking all over for it. But he did just fine with his hands. Finally came something you would expect to hear only if you relied on “the infinite improbability drive” from the Hitchhikers Guide to the Galaxy. Yes, the most improbable thing was an arrangement of Richard Strauss’s 1895 tone poem, Till Eulenspiegel’s Merry Pranks, arranged for quintet by one Franz Hassenorhl. Well, taking a piece originally written for an excessively huge orchestra and arranging it for quintet results in a version in which everyone gets a workout. Francine Trester was amazing on the violin, as well as agilely leading the ensemble—her part was full of exhausting tremolos, glissandi that traversed the entire fingerboard, and a whole range of gymnastics. The famous horn part with its dramatic jeering ascents followed by huge downward leaps (as if off of tall buildings?) was navigated with real panache by Michael Weinstein. The clarinet (Peter Cokkinias) and bassoon (Dominick Ferrara) had their share of cascades and outbursts, and the double bass, Michael Hartt, not only supplied supportive underpinning but also a battery of percussive sounds. It was certainly different and revelatory to hear it in this distillation and the musicians and audiences had a lot of fun. Poor Till is hanged, of course, but he also gets the last laugh. I agree with you about the acoustics. Its’ quite hard to balance tone and timbre in DFRH. Would you have any suggestions in how to make the hall more resonant and warmer for acoustic instruments? Unfortunately, this is the best of our chamber music halls and we suffer with this problem! Thank you and please do come back again! A sophisticated environmental sound system can be of tremendous help to a dry hall. Boston’s own David Griesinger has the Lares system, and this week’s New Yorker has an Alex Ross article on Meyer Sound’s Constellation system. $100k or so should fix Berklee’s problem. I understand that Bose has long been in the business of designing acoustic adjustment systems on a custom basis. They’re highly programmable and can expand and shrink the sonic space however you like. My friend Chuck Hieken used to be Bose’s chief patent counsel, and I remember his explaining this to me years ago. They install these in churches and similar places, so I have to assume that the costs are, relatively speaking, affordable. Bose is in this space, yes, as are some others, but the Lares system is the standard, I believe.